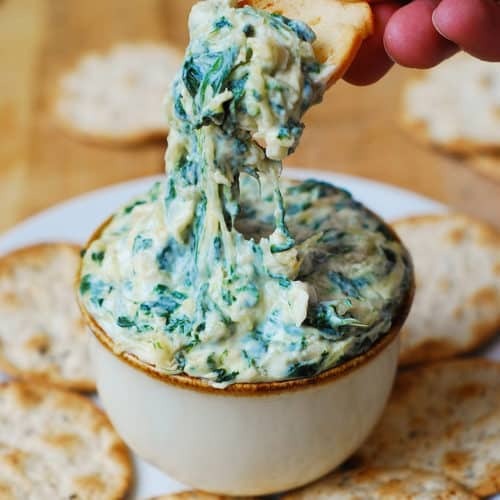 Spinach and Spaghetti Squash Dip – a delicious appetizer made with cream cheese, Parmesan cheese, Mozzarella cheese, Greek yogurt (or sour cream), cooked spinach, cooked spaghetti squash, minced garlic, spiced up with a touch of Cayenne pepper. This recipe is vegetarian and gluten free. 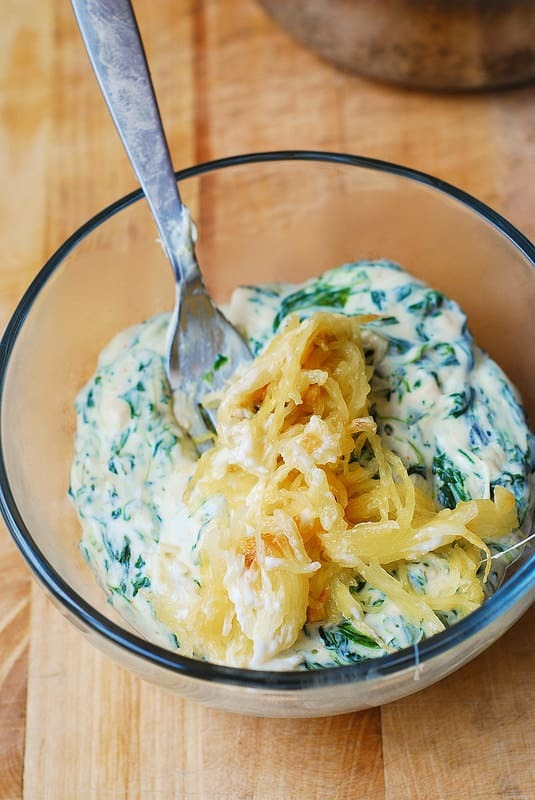 Who knew that spaghetti squash combines so well with spinach and all the cheeses? I love the texture that the dip acquired with the addition of squash. 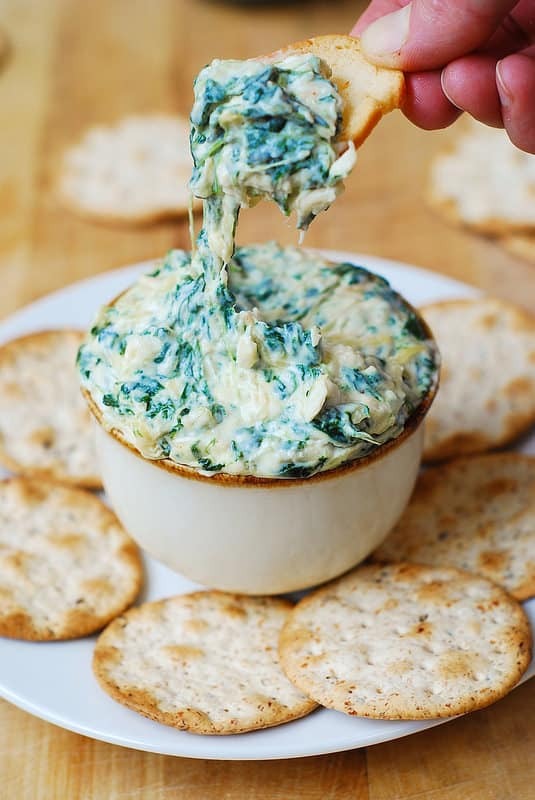 I might even prefer this spinach and spaghetti squash dip over the traditional artichoke dip. After you cooked the spaghetti squash, cooled it, and scraped it with a fork to remove the flesh in long strands, wring out the spaghetti squash by wrapping portions of it in paper towels and squeezing hard with your hands over the sink. Be careful not to drop the spaghetti squash into the sink if the paper towel breaks. Try to get rid of as much liquid as you can. You can cook spaghetti squash one or two days in advance. 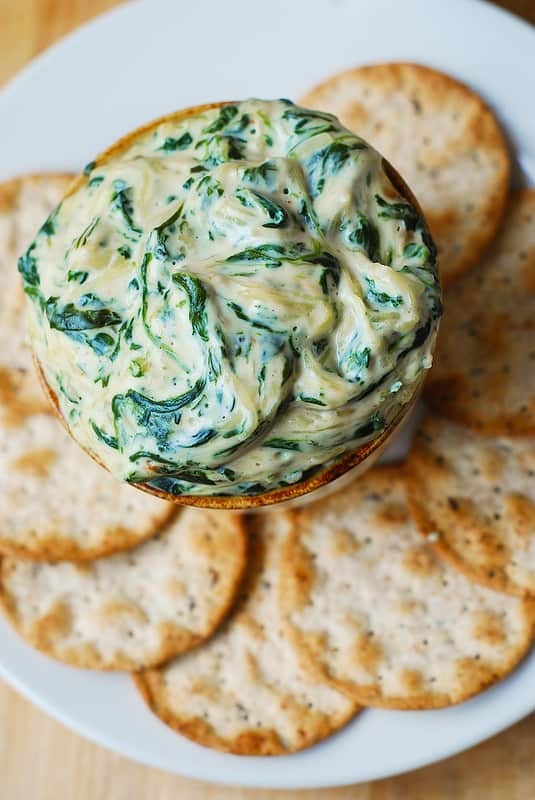 Once the squash is cooked and ready to be used, the dip is so easy to make. Just basically combine all ingredients until everything is heated through and melty and you’re done. The recipe requires 1 CUP COOKED spaghetti squash. 1 CUP COOKED spaghetti squash is usually 1/4 of a whole spaghetti squash. First 5 steps describe how to cook spaghetti squash (this can be done 1 or more days in advance). Important: Wring out the spaghetti squash by wrapping portions of it in paper towels and squeezing hard with your hands over the sink. Be careful not to drop the spaghetti squash into the sink if the paper towel breaks. Try to get rid of as much liquid as you can. 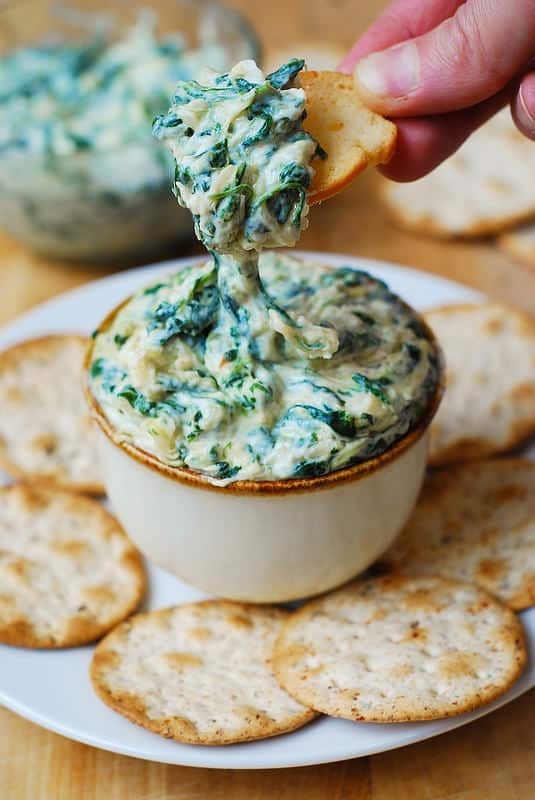 In a medium pan, combine cream cheese, Greek yogurt, Parmesan cheese, Mozzarella cheese, and stir, over medium heat, until cream cheese melts. Stir in spinach and spaghetti squash and cook for 1-2 minutes over low-medium heat, until everything is well combined and creamy. Stir in minced garlic, and remove from heat. 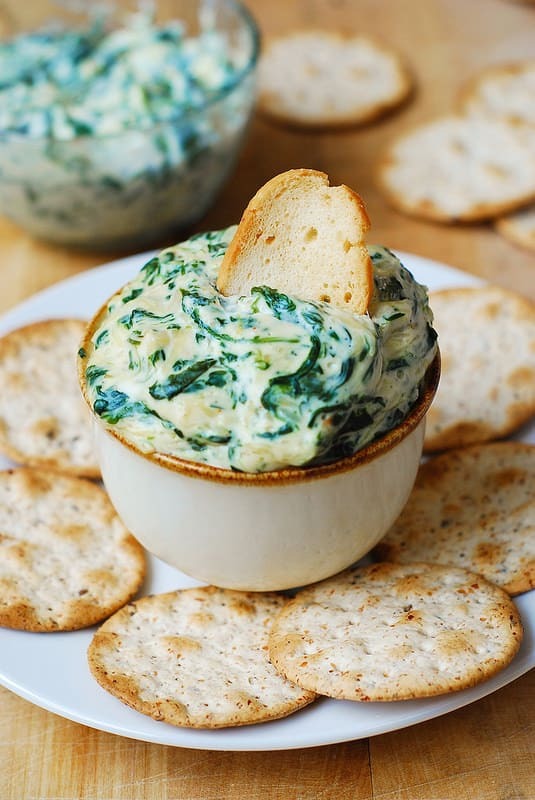 Season spinach and spaghetti squash dip with Cayenne pepper and salt, to taste. I made this for a tv show watching party, and it disappeared. Freaking good. Perhaps wring the liquid out of the spaghetti squash with cheesecloth. What a sneaky way to get more veggies in. I like it! Tonight your chicken pasta sun dried tomato dish!